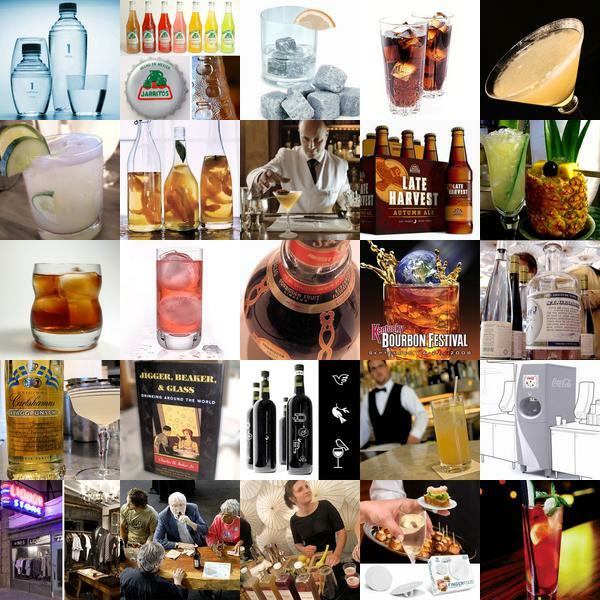 Liqurious Happy Hour time! You know the drill ~ click the pics to find out more about what people were loving this week…. In a bit of a haze right now, jetlag has been having me mentally all over the place! On fascinating lore (surrounded by rumors and speculation) ~ in Notre Dame de Reims (where nearly all the kings of france have been crowned) in the stained glass windows of the south transcript… there are yellow labeled champagne bottles which we heard from someone who heard from someone that Veuve Clicquot played such a large role in the history of the region over the centuries that you even see it in the stained glass. 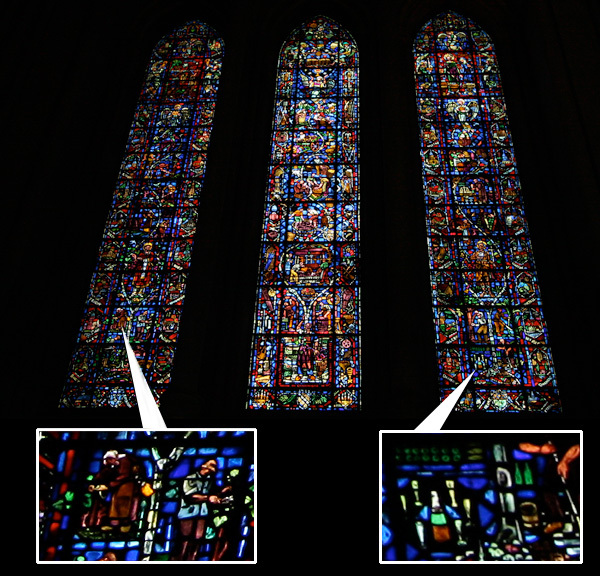 Speculate as to whether its complete fabrication, conspiracies of the past, the first product placement, etc as you wish… i’m just showing you what we found in those windows, so you can join in on the fun too. See larger images of these wine making panels on the next page! 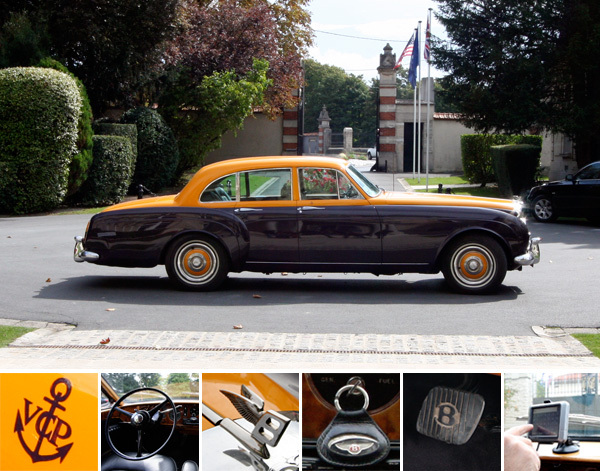 So traveling Veuve Clicquot style is quite a trip, they started us out on the yacht, flew us around in the helicopter… and now here’s the most impressive car… Who knew a 1960’s yellow and purple Bentley S3 could be so appealing? I love fast cars, i love beautifully designed cars, and apparently i love the vintage woody not at all discreet Veuve Clicquot Yellow and Purple Bentley? I couldn’t resist taking two rides in it with Stephane Gerschel as we drove around Reims… and every time i sat fascinated not only by the tiniest details (from the jeweled fuel light to the insane speed of the windows to the amusement of seeing a GPS in a car of that vintage)… You have to check out the rest of the pics! You would never believe how hard it is to cull from the hundreds of pictures from each day to figure out what to post! I’ve thought and rethought and dreamt about how to describe this trip, how to break up the posts, how to tell you about all of the incredible things that have happened in the last three days, and somehow it all comes across sounding quite possibly a bit gushy and cheesy. So, you know what? I’m just going to be completely honest with all of you, and even though i have about 1000+ pics of so many insane adventures and stories, here’s the plan: i’m going to work my way through them in images, sharing with you piece by piece, scattered with little stories as i remember them. Ok, but, moving along ~ HELICOPTER RIDE! I’d never been on a helicopter, and the crazy, secret loving itinerary planners of this trip worked in massive surprises for us everyday where even the drivers didn’t know what was up until we arrived. So imagine the looks on our faces when we pulled up to L’aerodrome Reims Prunay? 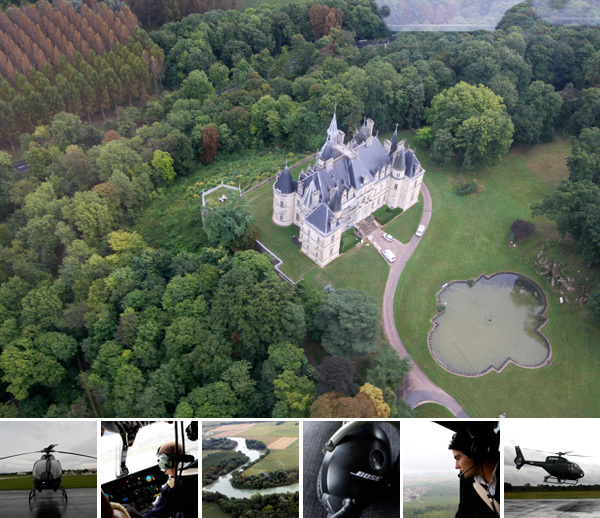 And when we are whisked into “the rolls royce of helicopters” (leather seats, Bose headsets, etc), and soon peering over at the champagne region from bird’s eye view, watching all of the tiny people, vast vineyards, circling the mountain… then suddenly you see it. Madame Clicquot’s historic Boursault Castle. Mind. Blowing. Go see the rest of the images on the next page! Over lunch at Madame Clicquot’s Country House, Andrea Crippa, Directeur Marketing & RP International for Veuve Clicquot, gave us a first look at a prototype of their latest design collaboration with Porsche Design which is said to launch in 2009. Here is your first look at the Veuve Clicquot Ice Cube. “PRESS. CHILL. 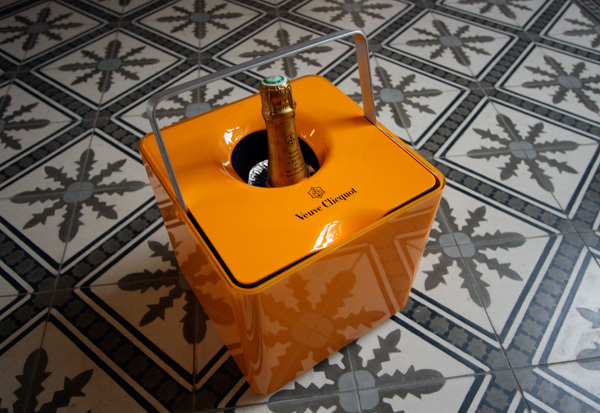 SHARE.” This is the ice bucket you want the next time you’re stuck in the middle of a desert with good friends and a bottle of champagne… While it looks like a mere ice bucket in the classic Veuve color at first… once you pop the top, you will find two specially designed champagne flutes and two buttons. Now the magic about this design is the technology ~ after 5 years of r&d ~ Veuve Clicquot has developed a system that will instantly cool a bottle of champagne in around 20 minutes, and keep it at the perfect chilled temp for 4 hours… The cooling core can be used twice (or for 8 hours in one go) - and after that you can use the bucket the old fashioned way by filling it with ice! It is currently unclear whether there may be options to buy refill cores to futher use the instant cooling system that draws heat out of the bottles and into a heating stone… perhaps they’ll even get creative and devise some other options to insert into this nice simple ice bucket. 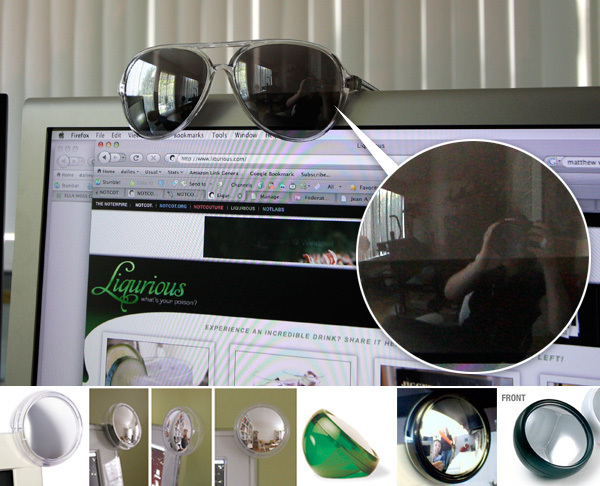 See the next page for pics of the prototype and packaging. How beautiful are these tiles? I needed a good excuse to share them, and they were such a nice contrast to the bright ice cube, i couldn’t resist being that girl that sat on the floor shooting pictures of a prototype while the others had coffee. UPDATE! : The bathroom was so gorgeous and huge as well i’ve added pictures of that as well…. 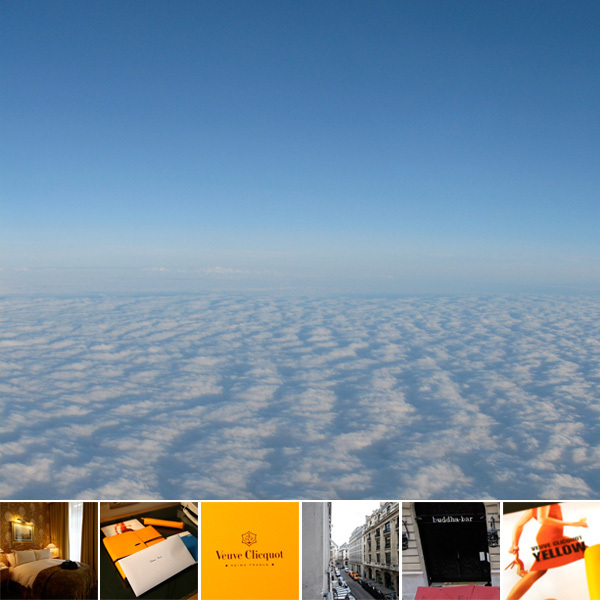 Ok, we’re going to jump out of order a bit, but i am far too excited by the gorgeously inspiring chateau Veuve Clicquot moved us to today… imagine waking up from a jetlagged nap and feeling like you fell into a time warp? 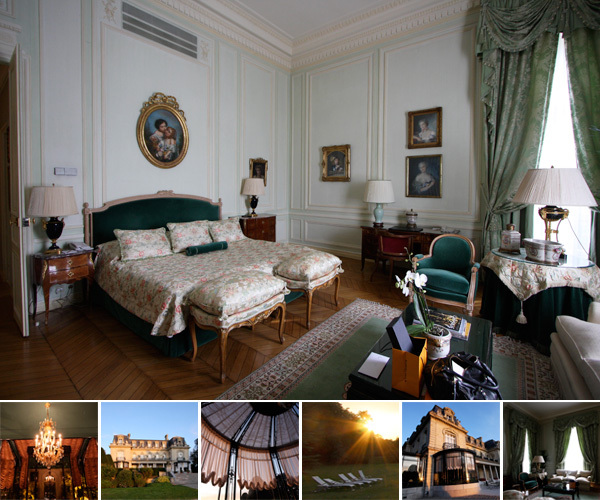 Welcome to Chateau Les Crayeres in the heart of the Champagne of France… the grounds, decor, rooms, lounge, restaurant…. it’s all breath takingly stunning. Don’t believe me? You have to take a look at the rest of the pictures on the next page… wow. I’m sitting on that bed in the pic right now, and i can’t help staring off every few minutes discovering new details, from the paintings, to the wallpaper patterns, to how ornate the extra high ceilings are! The pics on the next page of the circular bar areas with the petticoat like curtains are so sweet! NOTCOT Note: While i’m running around france learning about champagne at hyper speed, it’s hard to get much time or a good connection to work from… so good thing Anna has my back, and found this super awesome Band in My Pocket! 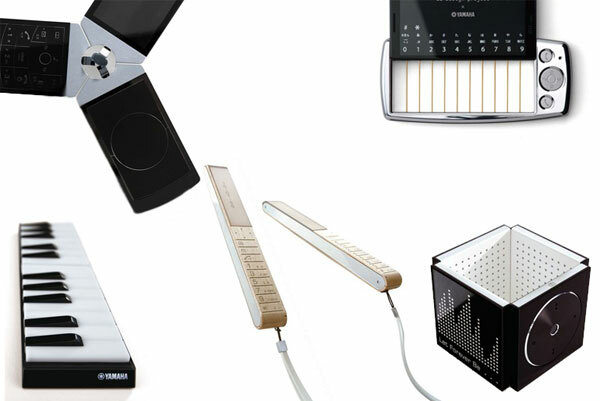 Yamaha has teamed up with au Design to create Band In My Pocket - a series of cellular phone prototypes that also function as musical instruments. Depending on the prototype you use, you can turn your phone into a brass instrument, drum sticks, piano, string instrument, etc. The au Design website is in Japanese, but be sure to check out the videos that showcase each design (click on the black box with the arrow beneath the diagrams). Also worth checking out are videos of Band In My Pocket in action over at Bola Sociology’s blog. Check out the individual phones and their uses on the next page! Veuve Clicquot - the food! 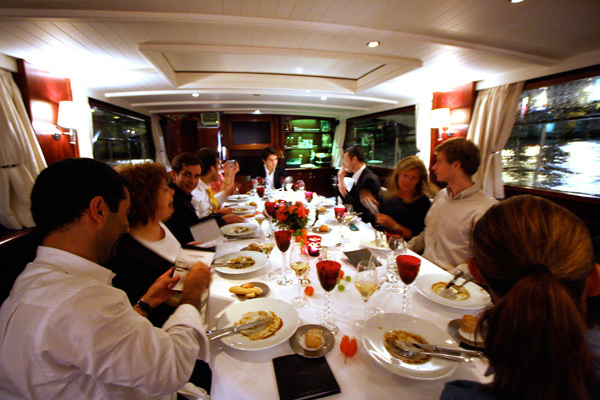 So, in the last post you had a chance to see the incredible boat and views and the Riva/Veuve Clicquot collaboration, but what did they serve us? Here is a walk through with pics of the menu to explain all of the deliciousness served… from the Crab tasting in gazpacho juice, to the Morels in asparagus cream and beef consomme with a lobster medalion, to Veal filet mignon with truffles, potatos mousseline with truffles and baby onions, served with a spicy juice, to the two desserts - wild strawberries in a small cookie with a red berry ice cream macaroon, and a hazelnut in a caramel and dacquoise ice cream……. to the cigars and cognac that finished off quite a spectacular culinary feast and quite the introduction to the playful leisure loving Veuve Clicquot lifestyle… So feast with your eyes on the next page! …but for now, i got some pictures up before i left the hotel this morning so here’s a peek at last nights adventure! 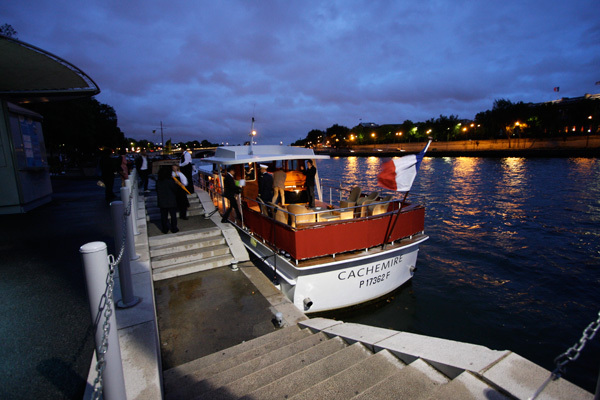 Incredible boat ride up and down the seine for dinner last night - on the next page are images of the experience - including the absolutely gorgeous Riva boat collaborations with Veuve Clicquot in person, seeing the eiffel tower lit up blue with the stars of the EU while sparkling to mark france’s term as EU president, meeting Lia Riva and hearing stories of life in Monaco and her childhood of gorgeous boats, and ultimately this was the start of our getting to know the Veuve Clicquot family, and truly understand how rich the history of this brand is, and experience how passionate the individuals involved are in quality products, experiences, and DESIGN! Ultimately it’s becoming very clear that more than just a brand, Veuve Clicquot is a lifestyle, and the lifestyle they have created, is certainly one i’m sure we could all get used to! So yesterday was a whirlwind day of hopping on air france in LA, finding myself in Paris, whisked from CDG to Le Faubourg Sofitel, and before i even get into meeting everyone - drinks with Christophe Pillet - meeting the veuve team - dining on a yacht up and down the Seine - and more… here’s what i first encountered upon arrival ~ breathtaking clouds, quite possibly the most comfortable bed i’ve ever lay in, gorgeous Veuve Clicquot gifts and notes awaiting on the desk, adorable awesome packaging for the Hermes soaps in the bathroom, and the Buddha Bar outside my window… take a peek at the photo series part one on the next page! For now… its 7:30 am, and i have to run to meet everyone at 8, so more images as i find time/internet! 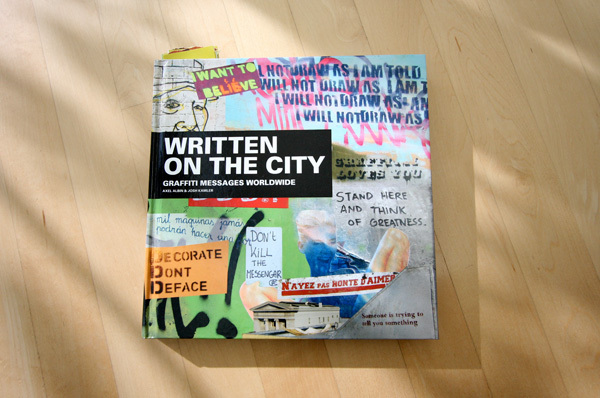 Written On The City has been collecting up imagery from around the world of textual street art ~ and the book is now here! This project is the brainchild of Axel Albin and Josh Kamler of Language In Common. Trying a new form of book review ~ scanned in a bunch of random pieces of pages i liked to give you a feel for things on the next page! Also ~ the letter, business cards, stickers, etc were so fun, i scanned those for you to check out too! And the next time you see some great texty street art, snap a pic and send it over to Written On The City! UPDATE: a winner has been chosen and emailed! Thank you for all of your entries! Jimmyjane launches their new Form 6 massager and you can win it! Just leave an amusing comment as to why you need this $185 designer massager more than anyone else, and i’ll pick someone to send to the nice folks at jimmyjane once i have free time in Paris this week (hopping a flight at 3:30 today!). This new Jimmyjane Form 6 massager is now completely waterproof, completely re-engineered with super subtle protruding buttons making the massager completely seamless/handle-less, and the gorgeous carrying case also acts as its storage/travel case and charger all in one! The original Form 6 picked up an IDEA award from BusinessWeed and the Industrial Designers Society of America, and honestly, i think this one far surpasses the original in design. So see a full unboxing and closeups of the details to this gorgeous new design on the next page, and don’t forget to leave a comment to WIN IT! 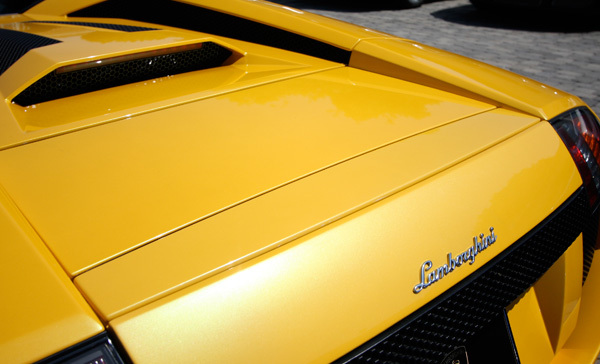 On random Sunday posts ~ just got back from tagging along with some friends test driving at O’Gara Coach - Lamborghini Beverly Hills to play with the Lamborghinis, Bugattis, Bentleys, Aston Martins, Rolls Royces, etc - being such a warm gorgeous day out brought the camera, and some of the colors and details were far too inspiring not to share… so check out some of the imagery on the next page! Crazy weekend here ~ been shopping quite a bit, and prepping for Paris (leave monday!) ~ so figured this was a good time to see what was popular on NotCouture this week! Looks like lots of bags and boots made the list. Click the pics to find out more! Ok, you know when you have some ridiculous idea, and you need to tell someone to see if its super silly or possibly functional, and no one seems to be online and not super busy working right now… so unfortunately for you, here’s my silly idea this late friday afternoon!